Inkanyezi is assisting Lension SA, Africa’s first manufacturer of biodegradable plastic bags, transform South Africa’s landscape, literally. 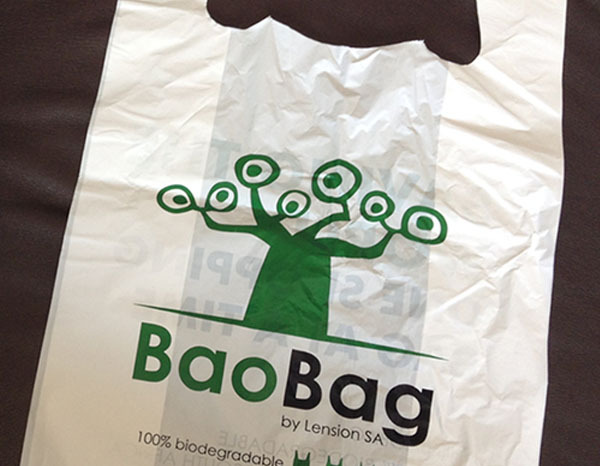 Lension’s innovative product range of plastic bags – the Baobag – are produced with an ECM Biofilms additive, that is scientifically proven to biodegrade through a metabolic process which essentially means the plastic is broken down and released as methane and carbon dioxide. Globally accredited, independent testing standards, had confirmed that Lension’s bags, with the ECM additive, would biodegrade 49% within 900 days. This was also tested in a landmark legal proceeding between the United States’ Federal Trade Commission and ECM Biofilms. The balance of biodegradation would take place at rate linked to its proximity to other organic material. Baobag biodegradable plastic is proven also to be fully recyclable and will not influence the recycling stream. But, while there are no hard and fast numbers, it’s estimated that somewhere between 250 to 300 million tons of plastics are manufactured every year with about 10% of plastics getting recycled. The bulk of it goes to landfills, or ends up as litter in the environment. Lension SA is establishing a factory within the Coega IDZ close to Port Elizabeth and hopes to make a major impact on the sector here and across Africa, as a proudly South African manufacturer. Lension expects to manufacture its first biodegradable bags before the end of 2017. “Many say the biodegradability claims are too good to be true. The most rigorous standards bodies, university research teams and the USA’s Federal Trade Commission, itself show this. “We are very excited about what this product can do for African communities and environmentally concious consumers and in fact retailers who are searching for a green product that is not more expensive that a non-biodegrable bag,” says Lension SA Executive Director, Mauro Paganini. Lension SA hopes to support a process for the establishment of a landfill gas to power project in Nelson Mandela Bay, Paganini says. Biodegradable plastics could grow the economy and solve the scourge of litter at the same time. Globally the production of natural gas from biodegrading material in landfill sites, is more entrenched but South Africa is catching on. Currently landfill gas to power plants in Durban and Johannesburg which produce 3MW and 11MW of power respectively, are indicating a growing trend in South Africa. Some 40 biogas energy plants across Italy save that country 25 barrels of oil per hour and supply 85 000 private homes with clean power. The government in Anchorage, Alaska earns US$1m (One million dollars) annually by producing gas from its landfill sites. Lension SA Executive Director Mauro Paganini said while plastics were considered destructive to communities, rendering plastics biodegradable by the additive that Lension SA uses in the manufacture of its plastic bags, transforms plastic into a valuable resource. Research shows that 54.5% of Municipal Solid Waste is organic material and 14.5% of waste that ends up at a municipal landfill site, is plastic. Essentially by tapping the natural gas from a landfill site governments or private entities produce significant clean power and profit by using waste productively.